Neither Messi nor Neymar were involved, but the other third of the world-famous trident was out in all his glory and some more to fire Barça into the Club World Cup Final with three goals in Yokohama. Particularly in the first half, Guangzhou Evergrande proved a worthy opponent, but Barça’s class eventually proved too much and a spectacular final against River Plate beckons on Sunday. Barça may have started without the Argentinian, a last-minute absentee with renal colic, but Guangzhou’s biggest name was also missing after Luiz Felipe Scolari’s surprise decision to leave Robinho on the bench. As expected, the Catalans dominated the possession right from the start, but without creating much in the way of serious danger for the first half hour or so. Meanwhile the Asian champions clearly weren’t suffering from stage-fright as they lapped up the pressure and threatened to cause danger with their rapid counter attacks. Barça’s first real chance didn’t come until the 23rd minute when Guangzhou keeper Li Shuai did well to beat Munir to a through ball from Iniesta. The same duo combined ten minutes later, but the Chinese stopper was again quick to get his hands on the Barça striker’s header. Beating the side that had already knocked out Club América of Mexico was proving to be anything but the formality that some had expected, but Barça finally got off the mark after 39 minutes. Rakitic thumped the ball with such power from outside the box that Li Shuai was unable to keep hold of it and Luis Suárez was at hand to smack the rebound into the back of the net. Guangzhou very nearly struck straight back as Elkeson nodded a free-kick goalward to force a staggering save from Claudio Bravo, but there was no further scoring in the first half. … then adds two and three! Five minutes after the interval and Barça extended their lead. The way Iniesta supplied the assist, not to mention what Suárez did with it, was a joy to behold. 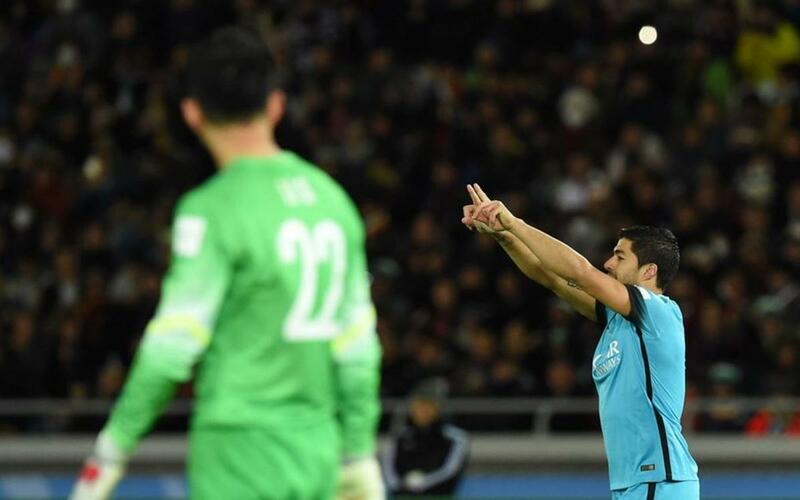 The Uruguayan followed an amazing piece of chest control with a turn and volley and Barça’s hordes of Japanese supporters could celebrate a 2-0 lead. The goal took the pressure of Barça, who from that moment on were able to settle into their usual game and delight the Yokohama crowd with the aesthetics of their trademark passing game. Following a period of intense pressure, the lead was extended after 65 minutes when Munir came down in the area and the referee’s finger immediately pointed at the spot. Suárez stepped up to complete his hat-trick and Luis Enrique was now safe to start thinking about River Plate, as Sergi Roberto, Jordi Alba and an outstanding Iniesta were replaced by Sandro, Adriano and Samper. The rest of the game played out with FC Barcelona comfortably assured of a place in the final but still enjoying almost all of the attack albeit to no avail. Preparations can now begin for what promises to be a cracking encounter with the Buenos Aires giants on Sunday.